Since I seem to be on a bathroom kick, how about this one for the steampunk explorer? The key to this look is to use a large scale map print so it's not overwhelmingly busy. Do you know if there's any place I can get wallpaper like that? :0 This picture has me drooling and whimpering. 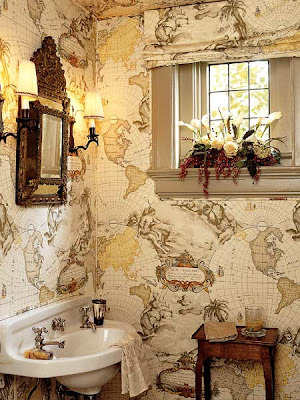 There is very little in this world I love more than antique maps, so this bathroom is just made of LOVE! I second the request above- where can we get wallpaper like this?!?! I believe the original site says the designer used the same toile for the roman shades and the wall treatments. The toile fabric would be applied with a sort of cornstarch paste. Think decoupage. This could be a bonus if you live in an apartment (no damage to walls from papering). Suggestion: a cotton print will cost less per yard and be easier to put on a wall than, say, a drapery fabric made in a similar pattern. That bathroom is beyond the bounds of awesome! At the bottom of this page you can order an 1816 map of the world that comes in 4 sheets and is 22" x 31" total. That looks pretty awesome. I will keep this in mind when I have my own place. It was fabric called Planisphere by Pierre Frey - The cheapest I could find it was 234.00 a yard at "www.decoratorsbest.com"
Would that work on any size bathroom or maybe just keep it small? It's wonderful by the way!